May be used with clear-vinyl, latex or white rubber drainage or extension tubing as a flow control device. These clear-polypropylene connectors are used to connect male external catheters to drainage and extension tubing or to latex or vinyl urinary leg bags. Urofoam® adhesive foam strips are used for securing male external urinary catheters to the body. They are available with either a single or double-sided adhesive coating. Urocare is the sole manufacturer of reusable latex leg bags, disposable vinyl leg bags and urinary drainage systems that incorporate the full advantages of our famous, patented Little Red Valve. This remarkable anti-reflux valve is enclosed in a hard plastic housing which prevents the valve from being accidentally held closed when in sitting or reclining positions. The valve is virtually self-cleaning and interference free ensuring uninterrupted flow and problem free use. 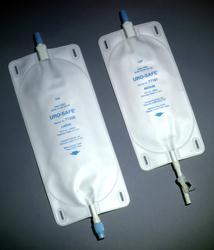 Thereby, preventing back flow of urine, and reducing the risk of bladder distention and possible infections often incurred with the use of previous inferior products that have only an unprotected flutter valve extending into the bag. The Standard Top Adapter (#6002) has a cone-shaped top with reverse grip which aids in the connection of rubber or vinyl tubing while providing a safe, secure connection. Removing the top adapter from the top valve housing exposes our famous “Little Red Valve.” This patented, anti-reflux valve is self-cleaning, obstruction free and prevents urine back flow – see above. A closer look at the valve housing reveals a large opening for quick, easy inspection and cleaning. An improved strap loop design ensures a firm hold and accurate placement. These strap loops are an integral part of the bag, we use no glues or other adhesives which at a later time might allow the loops to separate from the bag. They can’t be pulled off without damage to the bag. A durable, seamless, latex body combined with an obstruction-free anti-reflux valve makes Urocare latex leg bags the preferred choice for security and quality. Products No. 77321 and No. 77181 Shown The Uro-Safe® leg bag has the first, ever built in, anti-reflux valve that is virtually self-cleaning and interference free ensuring uninterrupted flow and problem free use. These universal fabric leg straps will fit most disposable vinyl leg bags and offer a vast improvement in comfort over the traditional latex leg straps packaged with most vinyl leg bags.